Kitchen Table Conversations Archives - Read. Think. Act. (August 6, 2018) Catherine Read interviews 11-year-old fashion designer and entrepreneur Skylar Johnson. 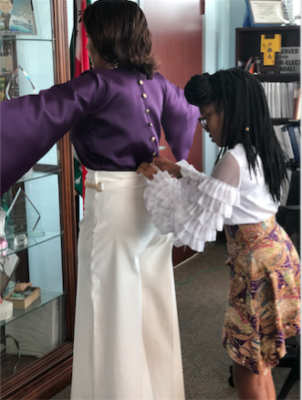 Skylar recently designed and stitched an outfit for Phyllis Randall, Chairman of the Loudoun County Board of Supervisors, to wear at her annual State of the County address. Skylar has been hard at work learning how to sew and design clothing starting at the age of eight, when she first attended an after-school enrichment program through her elementary school. She recalls her first creation as a mint green skirt with a lace overlay. Since then, Skylar has refined her skills, taught herself how to create unique patterns and experimented to find her style, inspired by fashion trends from the 1970’s. Both her Great Aunt and her Great Grandmother were seamstresses, and she thinks her love of sewing may have trickled down to her. Supervisor Randall learned about Skylar’s talent, and reached out to her to see about designing a special outfit for her State of the County address. After meeting with the Chairman, Skylar explored various ideas and found inspiration in fabrics that she acquired while on a family trip to California. She did not want to stitch a traditional suit, so she looked for inspiration in various fabrics and spiced up a traditional design by creating a beautiful royal purple satin shirt, with buttons up the back, paired with wide-legged, white linen pants. The outfit Skylar crafted was gorgeous, and perfect for the occasion. Skylar was recently featured in the 10th anniversary edition of Posh Magazine, as a young student using practical applications of STEAM curriculum who is going places. 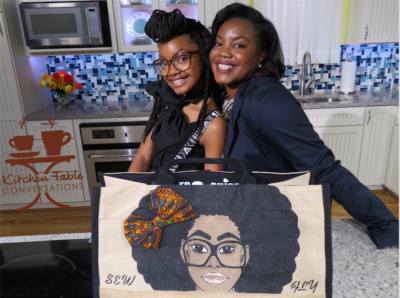 She encourages kids to follow their dreams, and talks about her clothing brand she has created called “Sew Fly Sky”. She continues to take sewing lessons and strives to learn all she can about the fashion industry. 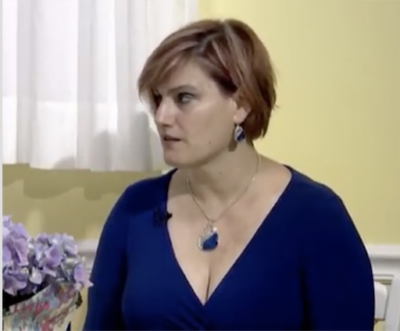 After that interview was published, she was invited to speak at a local elementary school to younger students about how fashion design is related to the STEAM (Science, Technology, Engineering, Art and Math) curriculum being taught. She walks the young students through the artistic process of creating a design, the mathematics of properly measuring fabric and creating a pattern using a variety of geometric shapes, along with the tools and technology needed to complete a project. She hopes that her talk was inspiring to the students. (July 6, 2018) Catherine Read sits down with Joyce Connery on Kitchen Table Conversations for a candid discussion about surviving breast cancer. Ten years after her diagnosis, Joyce shares insights and observations about being both a cancer patient and a survivor. Joyce received her diagnosis in 2006, when she was only 36 years old. At a routine physical, her doctor recommended that she get a mammogram done so it could be used as a baseline for the future. Joyce was surprised at the recommendation, considering she had no history of breast cancer in her family, but heeded her physician’s advice and went ahead with the scan. She was stunned when the doctor found something he was concerned about. 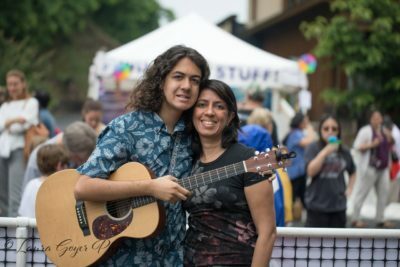 After a biopsy indicated it was in fact cancer, Joyce and her husband had to absorb the difficult news and forge a path forward. She immediately began to read as much as she could on the subject, so she could approach the challenge with her eyes wide open. Joyce soon realized that her diagnosis affected not only her, but also the people around her – family, friends and coworkers. It was difficult for her to accept the fact that she was not in control of her own destiny, not matter how hard to she tried to believe that she was. She read books and consulted with doctors, but what she learned was that there was no set answer of exactly how to move forward. Many of her treatment options had similar statistical outcomes, so she had to make the decisions that were right for her. Joyce felt very fortunate that she had such a strong support network, many of whom offered to help her throughout her treatment. Friends and family brought food to her home, drove her to chemo treatments and provided moral support when she was down. Because she was very public about her diagnosis and treatment, she learned to accept help and support when she needed it most. With one in eight women in the United States being diagnosed with breast cancer, chances are that a friend, family member or coworker you know will receive a diagnosis. Each patient is may have different needs, so Joyce urges people to listen to their friends and family and provide support where and when it is needed most. She points out that there is no “cookie-cutter” scenario – everyone’s story is unique. Joyce is happy to report that she has been cancer free (from the doctor’s perspective “no evidence of cancer”) for the past 10 years. Each milestone that is hit without a reoccurrence is another positive step forward. Thanks to better treatment options and earlier detection of the disease, many more women are surviving breast cancer and living full and happy lives. On the heels of finishing her chemotherapy treatments, Joyce decided to raise money for breast cancer treatment and research by participating in the Avon Walk for Breast Cancer – a two-day, 39.3-mile journey through the streets of DC. When her friends heard she was signed up for this challenge, many joined her to form “Team Joyce”. Surrounded by her strong support network, she completed the journey, and although still weak from treatment found solidarity and strength in accomplishing her goal.